Take a Basic Social Dance class with Mary Lou! 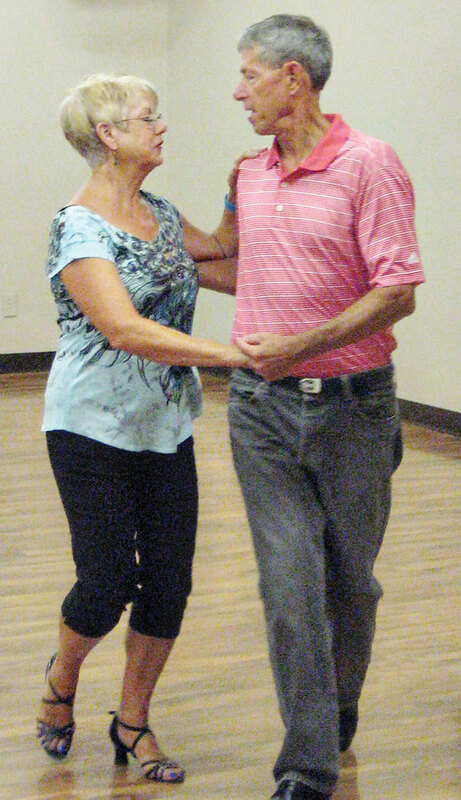 This month will begin the offering of Basic Social Dance classes in the Ballroom on Wednesday evenings. The entry level class will begin at 6:00 p.m. If you don’t aspire to Fred Astaire and Ginger Rogers status but want to avoid the Abbott and Costello syndrome, check this out. There’s nothing to memorize and we focus primarily on the music being played and our connection with our partner. It’s dancing reduced to its simplest format ever. Social dance is much less formal than ballroom dancing and allows you to strut your stuff on small dance floors to any kind of music you may prefer – standards, golden oldies, rock and roll, country, whatever suits your fancy. Within your first hour you’ll be able to move to a Fox Trot, Cha-Cha, Tango, Rumba, Swing, One Step, Country Two Step – you’ll amaze yourself and impress your partner. Promise! Walk in – dance out! Mary Lou Kaye, your trained and certified master instructor, dares you to have fun on the dance floor. It’s the Fountain of Youth you’ve been looking for. For a full schedule of classes call 480-939-1869 or e-mail Mary Lou at mlk@learnsocialdancing.com. You can also visit her website at learnsocialdancing.com. Register early so the class of your choice isn’t cancelled.